In order to improve heat prevention property of insulation board used in hot top during casting of steel ingot, thermal conductivities of insulation boards of solid structure and porous structure with different porosities were investigated using numerical simulation and calorimetric techniques. A heat transfer model used to calculate the thermal conductivity of insulation boards was developed, and the accuracy of the model was verified by calorimetric experiment. 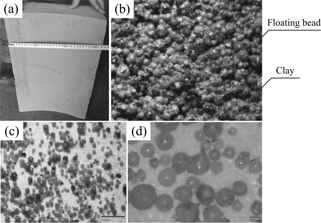 A series of porous insulation boards made of floating beads with different porosities were designed and effect of porosity on thermal conductivity of porous insulation board was investigated by numerical simulation. It was found that porous insulation board performs a better heat prevention property than insulation board of solid structure. Thermal conductivity of porous insulation board decreases notably with the increase of porosity. By contrast, the sizes of pores almost have no influence on the thermal conductivity of porous insulation board.